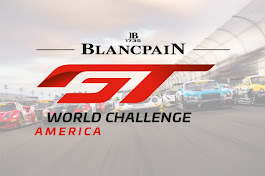 This edition of the "Greatest Spectacle In Racing" will be unique due to one major overriding issue, the new Dallara DW12 is racing in its first oval race and it happens to be the biggest, most historic venue one could choose for this maiden outing. Fans and drivers are excited to see how this platform will perform in traffic because these cars are much kinder to the cars that trail behind them due to the aerodynamic effect known as Mushroom Busting incorporated into the design of the body work. What this means is that the disturbed airflow behind the car has been directed above the racing surface much more quickly than previous designs and this allows a car riding behind another car to be more stable and be able to get a "TOW" from the car in front. Multiple car teams like Andretti Autosport with five cars entered may have an advantage if the team drivers work together as roller-derby teammates would work together to "sling-shot" each of their drivers forward. The additional subtext to this 500 mile race would be the durability of the new racing engine formula. Three engine manufacturers have been authorized to produce these engines and it would seem that the weakest link resides with the DW12's powered by the Lotus/Judd turbo-charged engines. How many laps will they go before they are 1) Black-Flagged for being too slow or 2) if they will be able to complete the 500 miles still running without a failure. Of course the final outcome will be watched by the Chevrolet and Honda engine team for their own ability to be able to complete the 500 miles still running without a failure as well. Predictions are that either KVRT's Tony Kanaan or defending championship team of Bryan Herta Autosport's #98 Alex Tagliani would be the winner at the end of 500 miles. If the race is won by a multiple car team that would go to Andretti Autosport with Ryan Hunter-Raey. Fastest female now that Danica Patrick isn't sucking the PR air out of the room goes to Andretti Autosport's Ana Beatrix. Top former F1 driver goes to KVRT's Takuma Sato. Highest placing former INDY500 champion would be Helio Castroneves - Motorsports Unplugged Radio. Driver introductions and pre-race ceremonies are about to begin! What's your favorite #Indy500 tradition? Lap 15 of 200 - Lotus/Judd cars are out of the race as predicted yesterday on Motorsports Unplugged Radio - "Wouldn't last 25 Laps"
LAP 17 of 200 - Restart - GREEN, GREEN, GREEN! YELLOW Flag - Mike Conway and Will Power in a big crash after Mike Conway pulss out of the pits. Conway on the pitstop ran into three of his crew members and was assesed a drive through penalty which he was going to serve on the next lap. Looks like more folks are seeking out the misting stations @IMS - worst heat of the day right now. Sad to see my man @12WillPower have to end his day early #Indy500 . A little momentum lost from his amazing start to this #IndyCar season. All cars safely through in very tight racing quarters - this Mushroom Busting design delivers a quality racing product! It's official: The temperature has reached 93 degrees, making the hottest #Indy500 in the 96-year history of the event. Holy cow. Screw green/white/checkers, this is going to be a GOBSMACKING finish to the #Indy500. LAP 176 - Franchitti back in the lead with radio commands to manage fuel at "4.3 on the dash"
CHECKERED Flag - Franchitti becomes a three-time winner under a YELLOW Flag. WOW! This is the first race of the season not won by a Penske Racing driver, but it still is a race win by either a Penske Racing or a Chip Ganassi Racing driver! Ashley Judd Franchitti is absolutely beside herself as well she should be - Dario Franchitti becomes a Three-Time INDY500 Winner - dedicates the race to Dan Wheldon in post race interview (paraphrased). "To be placed on the trophy besides Dan means the world to me." Dario gets an Igloo cooler full of icy water dumped on him ala winning Football Coach/Super Bowl style. Post race interview has Takuma Sato complaining that he had taken the position but Dario pinched him down so hard that it caused him to have to be below the whiteline causing his DW12 to spin and hit the wall. The 96th Indianapolis 500 is in the books and should be renamed the "Mushroom Buster 500" in honor of the technology that brought together a great, competitive, and record 35 lead change race. The major difference with the 96th running of the Indianapolis 500 ... the Greatest Spectacle in Racing ... and virtually all previous editions of the race is the racing platform technology. Most people who have been following American open wheel racing since the beginning know the trials and tribulations with the separation and unification of the series but few really have a handle on as to why this year will be different than any other year. The IZOD IndyCar Series has adopted a new chassis that handles the flow of air much differently than chassis of previous years and this change lays mainly in the concept of managing the airflow vortex that is created by the car and what happens to the flow of air after it leaves the back end or rear wing of the open wheel chassis. The car punches a change of the nature of the air ... or hole in the air and this allows a car that is following to pass through the same space more easily, with less drag. Some have come to term this effect as "Tow" but what is really happening is that the new design manages the flow of the air to allow for the vortex "mushroom" to be busted. An aerodynamic design feature first pioneered by Swift Engineering and put into play by some very enterprising aerodynamic engineers at Dallara for the Speedway Configuration of the DW12 chassis. 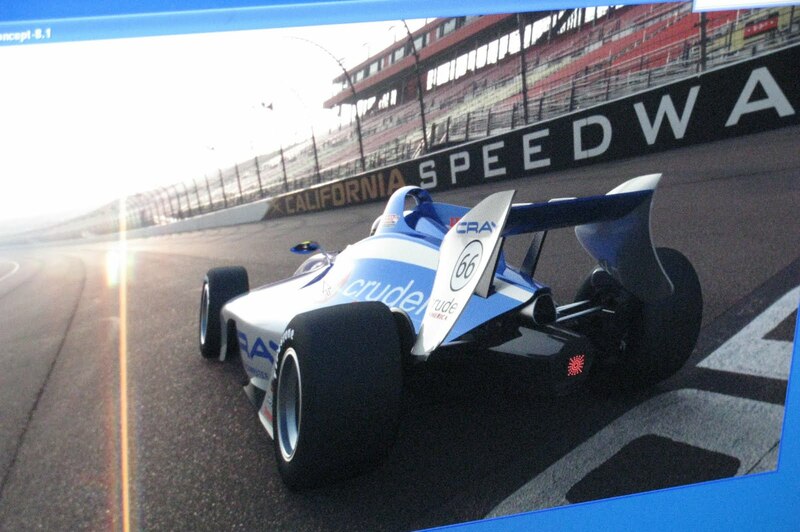 The IZOD IndyCar ICONIC Committee earlier this week, received a presentation previewing Swift's concept #70. The #70 is the latest evolution open-wheel car concept and incorporates aspects of the six previously launched concepts Swift has designed over the past nine months. The main thing that Swift was able to design in and keep in the #70 was a nose-to-tail racing safety and competition design concept known as "The Mushroom Buster" explained in the breakthrough design first introduced with Design Concept #66 above. 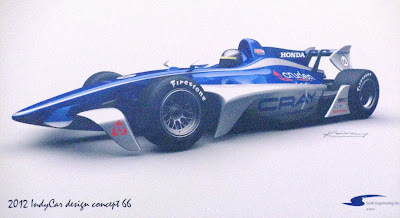 The IZOD IndyCar Series is reviewing the Swift and four other manufacturer's value propositions and is expected to make its decision for the next generation IndyCar for 2012 by June 30, 2010. Well, Dallara won the contract and the incorporation of the mushroom busting design in the DW12 is very evident, more so than with a road/street course aerodynamic set up. Maybe as this author had done with the quote used by Alex Tagliani for this article, Dallara should place at the bottom of each rear wing assembly [ht: Swift Engineering] ... do ya' think? This year, the "tow" will be the story of the 96th INDY500 race and it will be because of moving the dirty air vortex up and away from the track surface - Mushroom Busting - which will allow cars to be more stable and gain an advantage on the track if used properly. What is a racing series without its unplanned moments of friction? Short answer? ... not interesting at all and this last weekend in the IZOD IndyCar Series at Indianapolis Motor Speedway (IMS) had its share of unplanned moments of friction. During 2011 and many of the previous years at IMS during the qualifications process known as Pole Day and the following day known as Bump Day (new media Twitter communications hashtags #poleday and #bumpday), the unplanned friction centered around Series Management and Team relations. This year, the weekend was spiced up with the addition of integrating the nuances of a new racing platform formula that has the choice of three turbo-charged 2.2L engine power-plants - Chevrolet | Honda | Lotus . One of the biggest concerns, in fact, centered itself around the perceived lack of competitiveness and power developed by the Lotus engine. 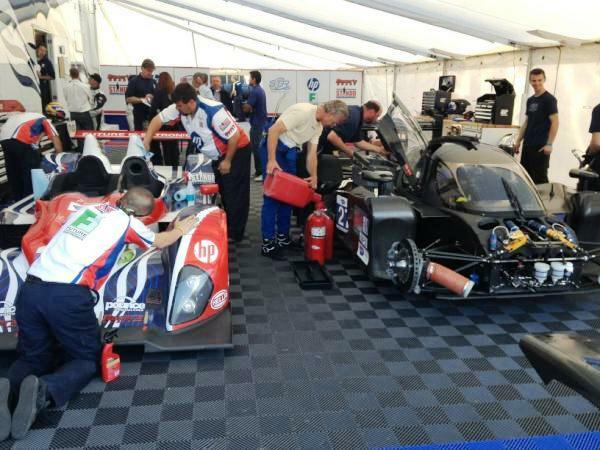 The cracks of this controversy began to show themselves amongst the four teams (HVM Racing/Dreyer & Reinblod Racing/Bryan Herta Autosport/Dragon Racing) and five drivers that had run the first three races of the season with mild moments of success. This mild success was not the result of having inexperienced and unsuccessful drivers piloting the new DW12 Dallara chassis with the Lotus engine (HVM's Simona de Silvestro - P3 in Atlantic Championship 2009 - DRR's Oriol Servia - P4 2011/11 top-10 finishes, BHA's Alex Tagliani - P11/6 top-10 finishes/2 poles, DR's Sebastien Bourdais - P1 2004, 2005, 2006, 2007, and DR's Katherine Legge - P3 in Atlantic Championship standings 2005 - the most winning driver being four-time Champ Car World Series champion Sebastien Bourdais). Before the traditional activities that surround the month of May at IMS in the lead up to the INDY500, two teams (Dreyer & Reinblod Racing/Bryan Herta Autosport) lobbied series management and won release from their obligation to use the Lotus engine in their DW12's, in fact one team, Bryan Herta Autosport did not travel to the fourth race of the season at Sao Paulo, Brazil to prepare for the transition to the Honda engine. After Sao Paulo, Dreyer & Reinbold racing negotiated an alliance with Panther Racing to be supplied and supported with a Chevrolet engine which had them change their logo for the rest of the season to reflect the alliance. During the first chance at getting practice at Indianapolis Motor Speedway, Lotus had trouble delivering engines for Dragon Racing (while Dragon Racing launched a lawsuit to seek about 4.6 million dollars in damages due to the breach in their contract). The team missed out on six practice sessions and sought permission from the series to change to a different engine supplier. 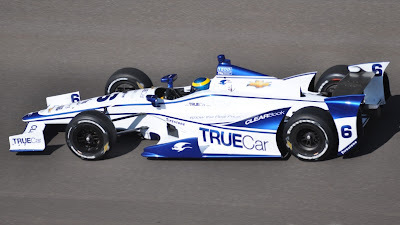 With permission granted, Dragon Racing was able to get Sebastien Bourdais and Kathrien Legge through Rookie Orientation on Thursday with Chevrolet engines. In the meantime, in order to save some face, Lotus put their support behind a one-time team effort, Fan Force Racing to place 47 year-old Lotus driver/ambassador and former Formula 1 driver Jean Alesi on the track to qualify along side of the one remaining team of HVM Racing and Simona de Silvestro. During the activities over the week-end to fill the traditional 33 places allowed for the INDY500 field, many speculated that their may not actually be 33 cars that could qualify for the field. If this were to happen, it would be the first time since 1947 and result in an embarrassment to the new formula of the IZOD IndyCar Series. Other unplanned moments of friction came primarily through the process known as Bump Day. After the field of 33 cars is filled with qualifying runs, anyone who wishes to challenge to get into the field could present a car and post a time faster than the slowest qualified car and "Bump" the slowest car out of the field ... hence Bump Day. 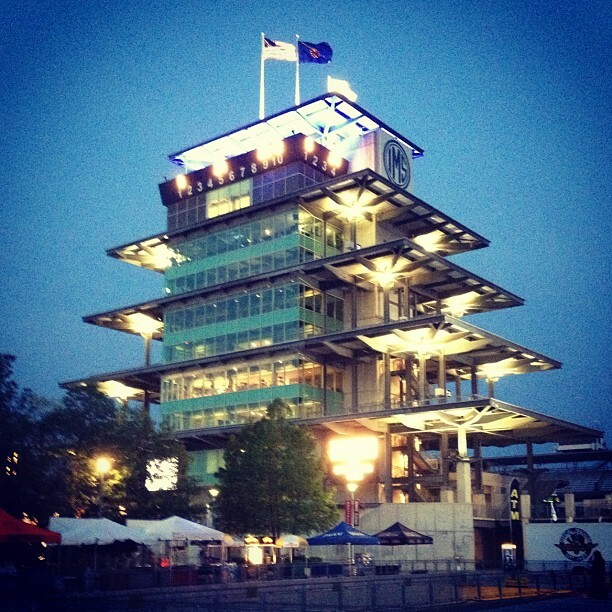 One can't help but wonder, though, if there's been too much back-room politicking going on since Indianapolis Motor Speedway opened its gates May 10 to begin preparations for Sunday's race. Almost every day since has had some sort of controversy - many bordering on comical - and rumors have run rampant about everything from an alleged owner-led charge to oust CEO Randy Bernard and IndyCar supposedly blocking two teams from fielding cars on Sunday's bump-less Bump Day. Then came the long list of penalties announced Sunday night, about 30 minutes after practice had concluded for a four-day off period. IndyCar found 18 different infractions among 13 teams in pre-qualifying inspection, and track historian Donald Davidson believes the numbers were a one-day record for the series, though fines have never been consistently announced. Few teams were immune and the entire front row was docked a total of $70,000 for five penalties split between pole-sitter Ryan Briscoe of Penske Racing, and Andretti Autosport teammates James Hinchcliffe and Ryan Hunter-Reay. Briscoe, in Charlotte on Monday to promote the Indy 500, wasn't sure his Penske team had actually violated the brake rule that brought a $15,000 fine. Penske team president Tim Cindric confirmed on Twitter that Will Power's car indeed had unapproved brake pads, but claimed the team never would have sent Briscoe out with the same pads once Power's had been flagged. Either way, Briscoe believed IndyCar - behind new race director Beaux Barfield and vice president of technology Will Phillips - had taken a huge step in levying so many fines. "It's surprising because we haven't seen much of that in the past," Briscoe said. "But I think we are seeing a new guy in charge of the rules now, and maybe in the past, some things have been let past, and I think it's good that teams are being penalized for not abiding by the rules 100 percent. Rules are there to be followed, rules are made to be enforced and they should be." That strong stance from the sanctioning body likely came as a shock to team owners - and it came during yet another stretch of off-track drama. It left only two Lotus-powered cars in the field, and they've been so far off the pace that many are openly wondering if they should even be allowed in the race. It didn't help that 47-year-old former Formula One driver Jean Alesi, who has never before raced an oval, said he felt "unsafe" in the car and was "concerned" for his fellow competitors because it is so slow. Rubens Barrichello, who spent 19 years in F1 before moving to IndyCar this season, believes Alesi is handicapped by his Lotus engine. "It's been very unfortunate that the Lotus power is not up to the speed," Barrichello said. "If we do end up racing with that 10- or 15-mile (speed) difference, it could be a problem for both of the (Lotus drivers). I hope just that he has a safe race." IndyCar needs Alesi and Simona de Silvestro in the race to avoid not having a full 33-car field for the first time since 1947, but it's possible that the two cars will be black-flagged for failing to maintain a reasonable speed. There was disappointment Sunday when no team owner threw together a last-minute entry to try to bump one of the Lotus cars out of the field. Both Jay Howard and Pippa Mann indicated they were close to putting together deals, but couldn't get Chevrolet or Honda to give them an engine. That led to rumors it was IndyCar who halted the engines to protect Lotus - an allegation series officials vehemently denied. Let's not forget the TurboGate saga, either, with Chevrolet losing two appeals trying to prevent Honda from using a new compressor cover on its turbocharger. The defeat has supposedly left powerhouse owner Roger Penske so infuriated he's refusing to speak to Bernard, but yet it's Penske who has a driver on the pole and two more starting on the second row. Penske, who at least publicly has preached a message of unity and support of IndyCar leaders, goes into the 500 perfect on the season with five poles and four victories. Honda, meanwhile, had only one driver qualify inside the top 10. So from the outside, it sure looks like a mess for IndyCar. But Bernard is fond of claiming "all press is good press," and if drama gets fans to tune into Sunday's race, then maybe IndyCar knows exactly what it is doing. Please be aware that the rule book has a provision that if cars do not maintain an adequate speed for safety reasons, they will be Black Flagged and removed from racing on the track. This rule is known as the 105% Rule. AS for the former Lotus drivers - Bryan Herta Autosport benefited the best from the change by having Alex Tagliani qualify at P11. The concept of a group of truly competitive cars in a third engine offering (dubbed here as the "Lotus Legion") seems to be disappearing ... and fast. It was only a month ago when it appeared that Lotus/Judd could not supply enough engines for the Month of May at the Indianapolis Motor Speedway (IMS) and the run-up to the INDY500. Bryan Herta Autosport and Dreyer & Reinbold Racing decided to stablize their sponsorship and racing efforts for the season by jumping to the other engine manufacturers - BHA with Chevy and DRR with a joint agreement with Panther Racing and Honda. Over the last couple of days during practice at IMS, Dragon Racing, with their drivers ... four-time CCWS champion Sebastien Bourdais and Katherine Legge, began to seek an alternative to being saddled with the lack of power, lack of engines, and the potential of shaky sponsorship wrapped up with the choice of the Lotus/Judd engine effort. Lotus probably began to see the writing on the wall early on because they brought their driving/brand embassador, noted Formula 1 driver Jean Alesi, over from Europe to add an additional car to the frey along with primary Lotus partner, HVM Racing. @PopOffValve If Lotuses are that slow in Race, they'll get black flagged before they get lapped a 2nd time. Done and done. No issue. Dragon Racing has finally made its season debut at Indianapolis Motor Speedway. The No. 6 car driven by Sebastien Bourdais turned its first lap shortly after 8 a.m. this morning. Bourdais turned 21 laps in the first hour, a fastest lap of 205.116 mph. The team has been mired in a legal dispute with Lotus, but it is transitioning to Chevrolet, the engine that powered today's laps. Dragon also plans to field Katherine Legge in her Rookie Orientation Program effort. Bourdais drove her car. As of 9 a.m., IndyCar had not released a statement saying Dragon had been permitted to switch engine manufacturers. Permission is required by series rules. Bourdais is taking a refresher course since he hasn't competed at IMS since the 2005 Indianapolis 500. That was his only 500. 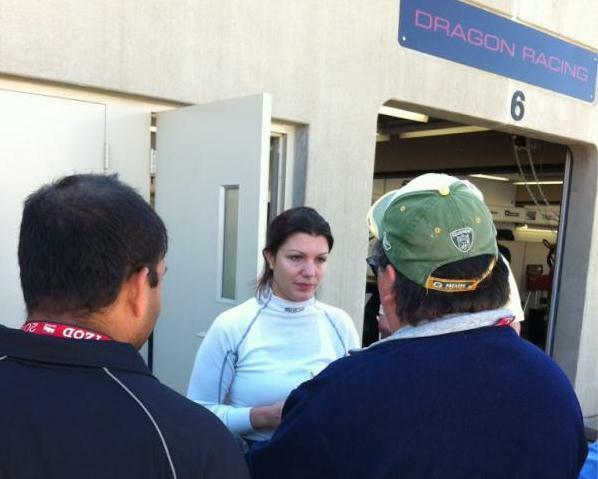 Legge is a true rookie at IMS, and her only oval-track race came in the 2006 Champ Car World Series season. She finished sixth at the race in Milwaukee. #IndyCar approves engine change for Dragon Racing. Sebastian Bourdais & Katherine Legge will switch from Lotus to Chevrolet power. Maybe the 2012 effort by Lotus and its original four-team partnership known here (at "... notes from The EDJE"/"Motorsports Unplugged") as the "Lotus Legion" needs to be changed to "Lotus Lesion"! As with any good acting gig, an effort worth taking a part in takes preparation. Patrick Dempsey has been in preparation for this role all of his life ... the role of exotic race car team owner, car owner, and driver in the American Le Mans Series, North America's premier sports car racing series. Dempsey is set to make his long-awaited debut in the American Le Mans Series presented by Tequila Patrón six-hour race event this weekend at Mazda Raceway Laguna Seca. The successful Hollywood film and television star ... and Dempsey Racing co-owner (with seven year business partner/driver, Joe Foster), is confirmed in the lineup for the team’s Lola-Judd prototype – part of the LMP2 field at the American Le Mans Monterey presented by Patrón. He is expected to share driving duties with his team co-owner Joe Foster and former ALMS Drayson Racing driver, Jonny Cocker. The addition of Cocker (Porsche Carrera Cup Asia Champion - 2005, British GT Championship - 2004) to the Dempsey Racing effort brings along a wealth of Lola car driving experience that Foster and Dempsy will benefit from. This will be much welcomed because it was only this March, Dempsey and Foster announced Dempsey Racing’s move into the LMP2 Class for a partial ALMS season in 2012. The team’s plans call for a full championship run in 2013 with the goal of an entry to the Le Mans 24 Hours in the near future, as well. This weekend, we almost can hear Patrick Dempsey say (under his breath/paraphrased) the famous quote from the movie, Sunset Blvd. 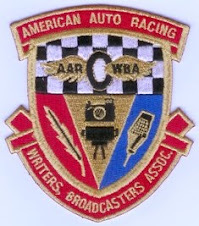 ... a street not too far from where Dempsey resides - "Alright, Exotic Automobile Racing World, I'm ready for my close-up." Patrick Dempsey, making his LMP2 debut in Dempsey Racing's new Lola B12/80 Judd. The actor/racer spun and high-sighted his Lola at the Corkscrew, which brought out one of two red flags. Prior to Dempsey's minor incident, co-driver Jonny Cocker, making his return to the cockpit of a Lola-Judd, posted the fifth quickest time overall and third best in LMP2 with a time of 1:19.698. Dempsey Racing's LMPC class open-cockpit ORECA FLM09 driven by Henri Richard, Duncan Ende, and Ryan Lewis ended up 11th out of thirty-four cars overall and 5th in class out of eight cars entered. Ryan Lewis is credited with the #25's best lap at 1:20.952. Jonny Cocker ‏ @jonny_cocker - P3 in class in Quali.. Not bad considering the car is only 2 weeks old! Well done @GoDempseyRacing Lots of work to do but we'll get there!! 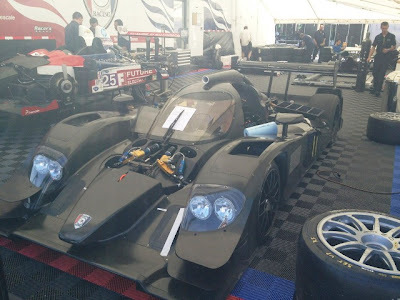 This from ALMS.com - The Dempsey squad qualified third in class in its ALMS P2 debut. Jonny Cocker set a lap of 1:17.494 (103.967 mph) in the Lola-Judd he drives with Hollywood star and team co-owner Patrick Dempsey and team co-principal Joe Foster. This first Friday in the month of May events around the Indianapolis 500, the drivers involved in the MAZDA Road To Indy traveled to the Indianapolis Motor Speedway (IMS) for the second annual MAZDA Road to Indy Oval Clinic, joining their fellow competitors in all three MAZDA ladder system series - the Cooper Tires USF2000 Championship Powered by Mazda, Star Mazda Championship Presented by Goodyear and Firestone Indy Lights. 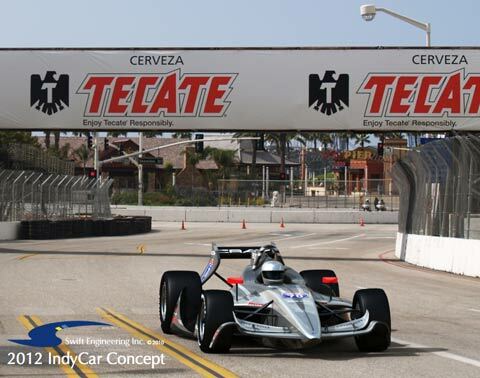 Hosted by INDYCAR’s Director of Grassroots Initiatives Jason Penix and led by multiple driving champion and USF2000 driving coach Gerardo Bonilla, the clinic covers all aspects of oval racing with the intricacies supported by video footage exhibits. 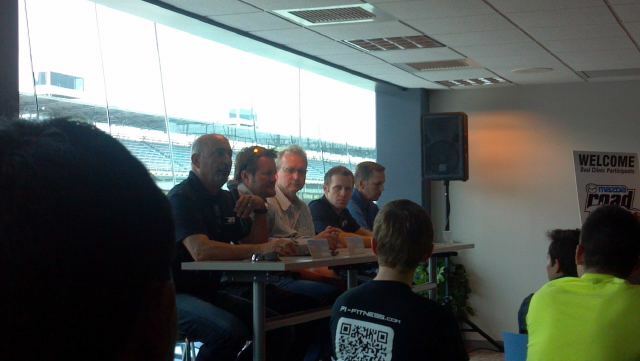 Oval veterans participating in this year's panel of experts included Rahal Letterman Lanigan Racing team owner / former Indy 500 winner Bobby Rahal, INDYCAR President of Competition Beaux Barfield, Performance Advisor / spokesman Johnny Unser, IZOD IndyCar Series driver / team owner Ed Carpenter, and former Indianapolis 500 Rookie of the Year / Elite Engines owner Steve Knapp. 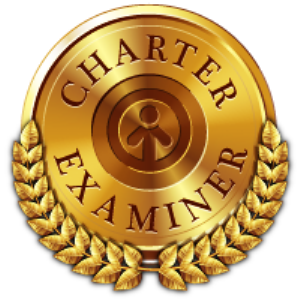 The participants receive training on the basics of oval racing, best practices of oval testing, working with spotters, how to prepare themselves physically for an oval race, safety, and how to approach oval event practice, qualifying and race day. 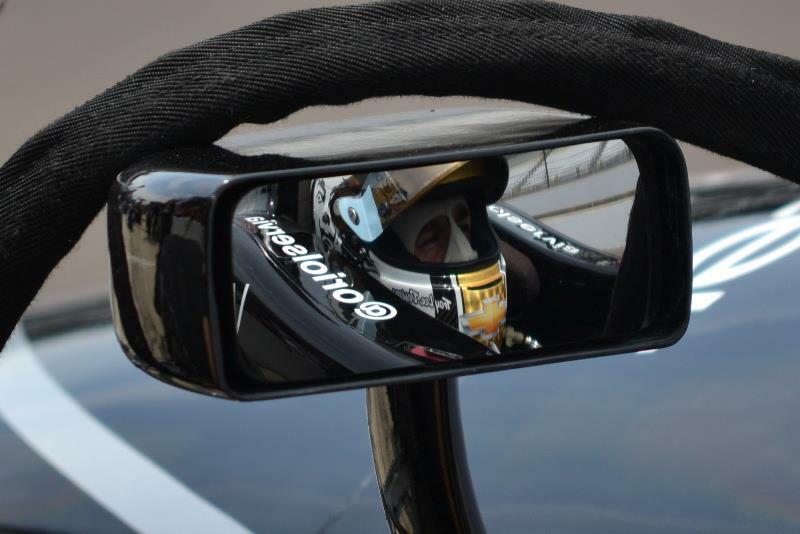 The drivers from all three open-wheel disciplines will have the opportunity to put these lessons to practice the very next day during a test at nearby Lucas Oil Raceway on Saturday, May 5. These young competitors, many of whom will be turning their first laps on an oval course, will have a combined five hours of testing on the short 0.686-mile track. The Cooper Tires USF2000 Championship Powered by Mazda and Star Mazda Championship Presented by Goodyear drivers will be in serious preparation for the popular “Night Before the 500 races″ to be held on May 26 – 2012 Round 5 for both USF2000 competition (the only oval event on the series calendar) and Star Mazda Championship. At the end of the month of May, all of these future Indianapolis 500 competitors will be honored at the inaugural Mazda Road to Indy Victory Celebration on May 27 at Sensu Restaurant and Nightclub in downtown Indianapolis. 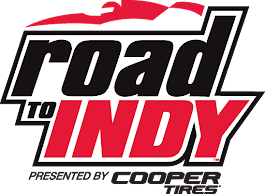 Podium finishers of the Firestone Freedom 100 (Firestone Indy Lights race run at IMS) and "Night Before the 500 races" at Lucas Oil Raceway (USF2000/Star Mazda) will be recognized for their accomplishments at the event that follows the 96th Indianapolis 500. Roger Bailey, former executive director of Firestone Indy Lights, will be the guest of honor. A painting of 2011 Indianapolis 500 champion Dan Wheldon, which motorsports artist Bill Patterson will produce during the event, will be auctioned – along with several prints - at the conclusion of the event.